Many of the social media tips we share—the ways to create a marketing plan from scratch, how to get more followers, how to get more clicks—often focus on the small business side of social media marketing. Now imagine achieving social media success when the brand you’re trying to promote is you. Personal branding on social media is a topic we’d love to dive into a bit deeper, starting with this overview of tips and strategies. I’m grateful to have found a number of useful tips on how building a personal brand can be made easier with social media. Here’s how to get started. You, my friend, are a brand. You’re a brand. I’m a brand. We’re all brands, whether we aim to be or not. Personal branding, then, is the process of managing and optimizing the way that you are presented to others. And social media is one of the keys (if not the biggest key) to managing your personal brand online. Just how vital is a personal brand strategy with a social media focus? One illustration of this is to do a Google search for your name. Your full name, nickname, middle name, etc. If your name is common, add other elements that might help define you like your occupation, your employer, your school, etc. Here’s what a search result looks like for my first and last name. Three of the first seven results are for social networks—Twitter, LinkedIn, and Google+. One result is my personal website. The other three results are places where I blog. In my case—and likely for yours, too—social media and content creation form the backbone for my personal branding strategy. 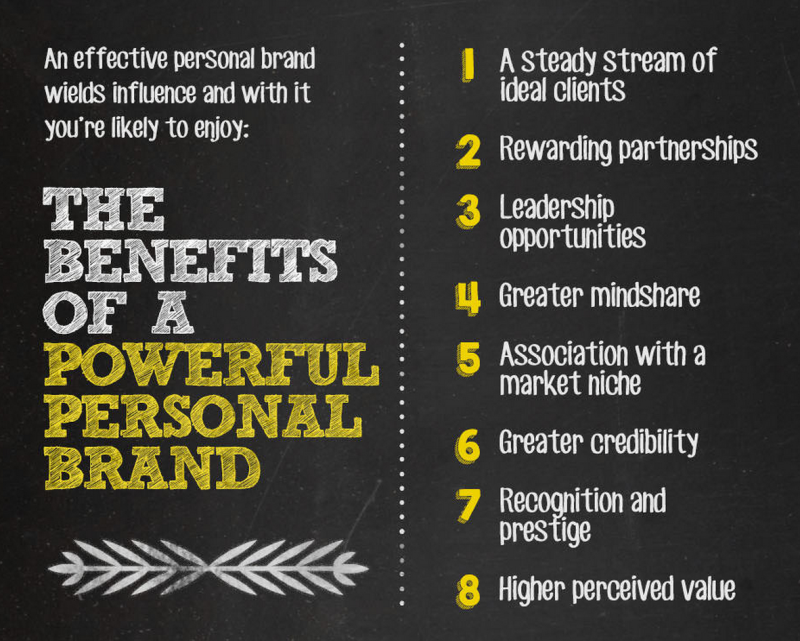 This infographic by Feldman Creative and Placester does a good job of hitting the high-level benefits of keeping this personal brand well-maintained. Inspired by some great thought leaders on the topic, I put together the following five personal branding tips that have helped me the most as I’ve optimized my personal brand. Finding this unique element (or two or three unique elements) will help you set up and target the rest of the steps below for creating your personal brand strategy. Jayson Demers, writing at Inc, has a great way of summing up the value of finding your expertise. Before you can establish or develop your expertise, you have to decide what you want to be known for. The world of personal branding is flooded with competing entrepreneurs, so it isn’t enough to choose a general field like “marketing” or “human resources.” Instead, it’s best to develop yourself in a very specific niche. With a niche focus, you’ll have more opportunities to prove you know what you’re talking about, and while your potential audience might be slightly smaller, it will also be that much more relevant. Specificity is a trade of volume for significance. He continues, explaining the role of social media in this development. If content is the fuel for your personal brand, social media is the engine. There are many different ways to approach the process of determining your expertise. A couple that make a lot of sense for me include checking with yourself by asking questions and performing a bit of personal research on your favorite topics. What is the “one thing” that everyone says you rock at? What do you read about most often online? Will you still be interested in this particular area six months or a year from now? When I first started thinking about personal branding, I had a lot of varied interests—writing, social media, email marketing, magazines, journalism, sports, productivity. These questions helped me realize that my natural tendency was toward writing tips and resources. I’ve since narrowed my focus there, thanks to the help of these questions. At the end of this exercise, choose one to three areas of expertise to focus on. 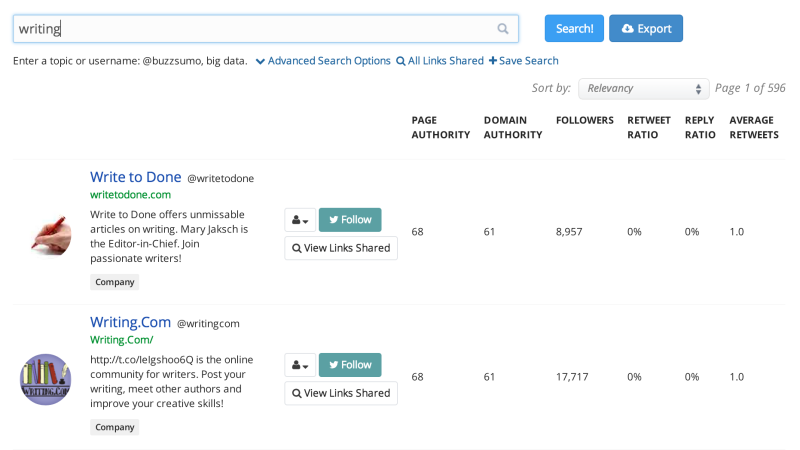 For the research aspect, you can try searching for which conversations and topics are happening around your chosen area or areas, as well as identifying which people currently share about those topics. There are a few great tools for this. On any social media channel, you can perform a keyword search for the areas you’re considering. On Twitter, for example, you can search for the keyword or hashtag and filter with a number of Advanced Search options like language, location, and sentiment. Do you need to choose a topic with a high volume of interaction? Not necessarily. It’s more important that the topic be something you are authentically interested in. You can always revisit your topics and rebrand as the conversations change, too. Do all your social media profiles look consistent? When I’m looking to learn more about a new contact I’ve made, I often find myself looking in multiple places for information. I’ll check Twitterand LinkedIn. I’ll view their Tumblr and their Facebook. It’s so helpful when these profiles match up. Keeping a consistent profile helps others find you easily, and it helps cement a picture of you in the minds of others. The fewer variations you have (ideally you’ll create one consistent look), the easier it is to be memorable. Here are a few steps to getting started. 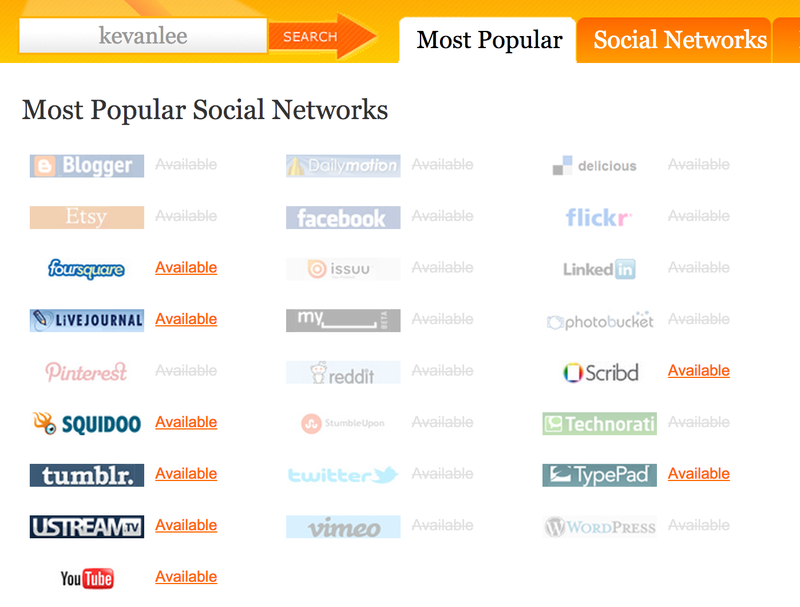 You can enter your desired username into Knowem to see its availability on over 25 of the most popular social networks. Once you have these results, you can reserve your name on any social networks you’re currently using or you think you might use in the future. In a perfect world, you’d have the same username in every location. If this isn’t possible for you, come up with a standard variation to use in the case that your first choice is already taken. First name and last name is the standard. Do your best to avoid nicknames, shortened names, etc., unless you use the variation consistently. As you build your personal brand, this will be a great way to make a memorable impression on others. There’s a helpful IFTTT recipe to get your profile photos synced up between channels. Every time you change your Facebook profile photo, your Twitter profile photo changes, too. They share a couple different options, too—the keyword headline and the power statement headline. Headlines work great in places like LinkedIn, Pinterest, and Instagram. Other sites like Facebook and Google+ often use your education, employer, and location as the identifying information for you. A headline might work great as a Twitter bio, too. You may even find a bit of extra space in the 160-character limit to expand a bit. Neil Patel shared some really useful Twitter bio tips in a post on the Buffer blog. Here are his seven his best tips. This tip has a lot of layers to it. In general, this could mean keeping your cover photos consistent across your profiles on Facebook, Twitter, Google+, and LinkedIn. On Instagram specifically, this could mean using the same filter on all your photos. On Pinterest, you could share a consistent style of image. One person who I think does this really well is Peg Fitzpatrick who creates a consistent style of image for her blog posts and shares this image on Pinterest and Google+. To take things one step further, here’s a bit of advice from Barry Feldman on three of the factors you might consider in creating a consistent design look for your brand. How can I find the right social profiles to edit? 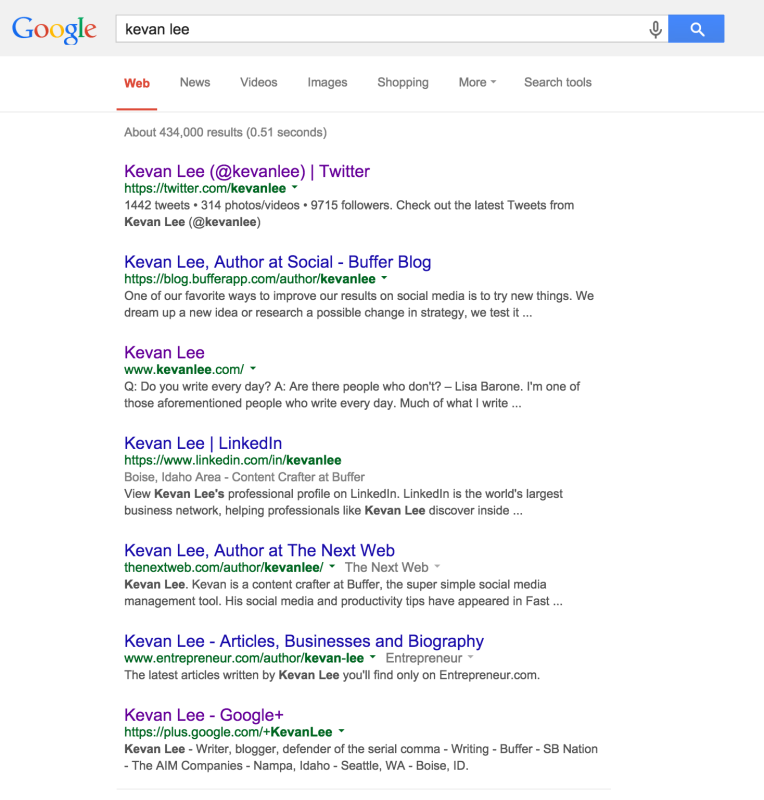 Use your Google search results page to identify profiles and pages that you can edit. A good rule of thumb: If it’s on page one, it should match the look and feel of your brand. At the very least, complete your profile everywhere. Can a person manage separate profiles for work and personal? Separating work and personal seems like a great option to consider; however, things get a bit complicated if you’re hoping to keep the same name on both accounts. When people search your personal brand, it might make sense for all appropriate information to come up under the one name—therefore a separate alias could be best for a non-work social profile. Should you change the way you post in order to fit the channel? OThat’s a great one to consider! Often times, the specific way that you compose a message might change depending on your channel—for instance, micro messages on Twitter, longer messages on Facebook & Google+. How will others get to know you and your brand? Making yourself easy to find is the first step toward a great brand. The next step: Sharing your enthusiasm and expertise with others. Taking an active role on your social channels is key to gaining influence and followers. A research study on Twitter followers showed that one of the most significant factors in growth is posting consistently. The study found that those who tweet more have the most followers. It’s estimated that a person with more than 15,000 tweets has between 100,000 to 1 million followers. Research into the ideal frequency of posting to social media shows some good guidelines for getting started in choosing your sharing volume. Much of the research refers to company brands, so it’ll be best to use these tips as starting points for finding your own best frequency. 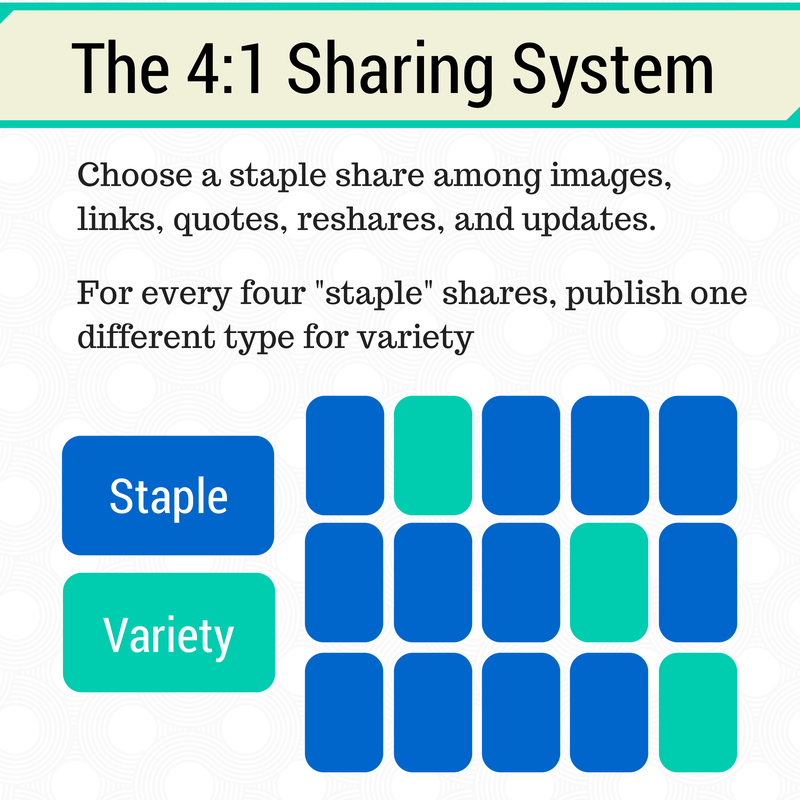 Choose a staple type of update to share: image, link, quote, reshare, status update. There are many other great ideas out there, too, about how to share to social media. You can check out a list here with some neat ideas like the 4-1-1 rule and the golden ratio. How many channels should I take part in? As many channels as you can handle while maintaining your consistency. In my case, I can handle one to two at a steady pace, and a couple more on a once-a-month basis. How will you make a connection with others? Sharing consistently to social media will help draw others to you and and your brand. Along with this, you can take a proactive approach to social media engagement by getting involved with your community. Barry Feldman has some of my favorite advice on this aspect of personal branding. His post on Social Media Today shared a number of takeaways that Barry found when studying a book by networking expert David Bradford. Here are some that Barry felt translated really well to social media. Follow up with new connections you make promptly, stay in touch, and always follow-through on your promises. Connect the people in your network to each other. Surround yourself with top-notch people. Don’t let awe stop you. Have the confidence to reach out to the best. Study the network of successful friends and leaders in your niche and follow their lead. Find mentors. Do as they do. Ask for advice from everyone you stand to learn from. Give as much as you can. Ask your connections if there’s anything you can do for them. Ask a lot of questions and listen. Tell people you’re excited to hear their stories. They’ll be glad to share them. Make yourself available to your peers and organizations. This is a great list of tips. And there’re several practical ways of applying these tips to your social media personal branding. Surround yourself with top-notch people. This one goes hand-in-hand with studying the networks of those you admire. 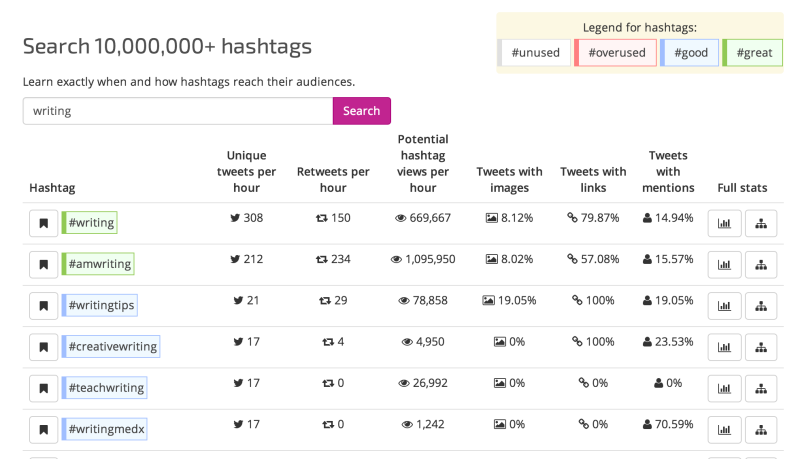 Using tools like JustUnfollow, you can see the connections of anyone on Twitter—and you can follow these connections with just a few clicks. Find mentors. Ask for advice. Give as much as you can. Does this sound a bit like a group or community? Facebook Groups, LinkedIn Groups, and Google+ Communities all offer an element of connection in this way. Make yourself available to your peers and organizations. Joining Twitter chats and Instagram hashtag campaigns can help draw you nearer to a community. What is the best way to track those who mention or message you? When we shared some surprising social media stats for company brands, one that stood out to me was how quickly people expect a response on social media. 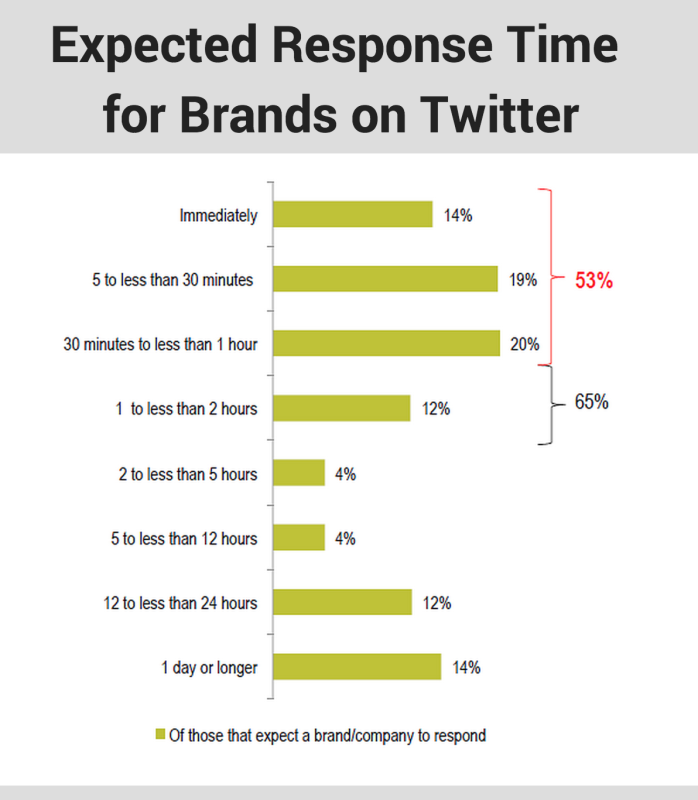 According to a study by Lithium Technologies, 53 percent of users who tweet at a company brand expect a response within the hour. I’d expect the time to reply to be a bit more lenient for personal brands and for different social networks. A good rule of thumb might be: Respond to mentions within 24 hours. Here are a couple of ways to track these mentions and reply quickly. 1. Track your mentions with a monitoring tool like Mention. Mention tracks any time your name surfaces online, be it in a blog, a social media post, status update, or otherwise. You can view the mention right from your Mention dashboard and engage with a reply. All major social networks do email communication really well. You can adjust your notification settings to see a wide variety of different types of interactions—new followers, new comments, mentions, messages, and more. When you have these emails arriving in your inbox, you can then filter them into folders and add labels as well. In Gmail, for instance, it’s possible to create a colorful inbox that alerts you to new mentions on social media. To take things one step further, you can connect your email to another service like SMS or desktop notification so that you can receive notifications in the most immediate way possible for you. Here are a couple ideas for recipes to help with customized notifications. Additionally, mobile push notifications can be quite useful for monitoring your mentions. Downloading the official app for your social channel (e.g., the Facebook app or Twitter app) gives you some great options in this regard. Hopefully these tips for building a social media personal brand strategy can help you in thinking about how you present yourself online. Pam Moore shared a great reminder about the importance of personal branding: It’s useful for everyone, not just the big names. What tips have you picked up for managing a personal brand on social media? Which of these tips might work for you? I’d love to learn from you in the comments!